Site of Margaret Pit, Heddon on the Wall (2009).Part of the remaining slag heap is visible in the centre. 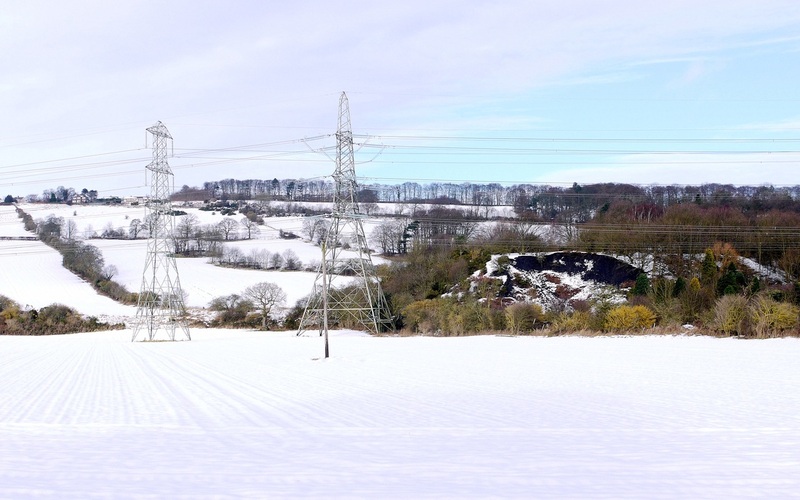 A field boundary to the left running up the hill in a straight line marks the tramway where the tubs were hauled up to the top of the hill, to the Heddon coal depot. 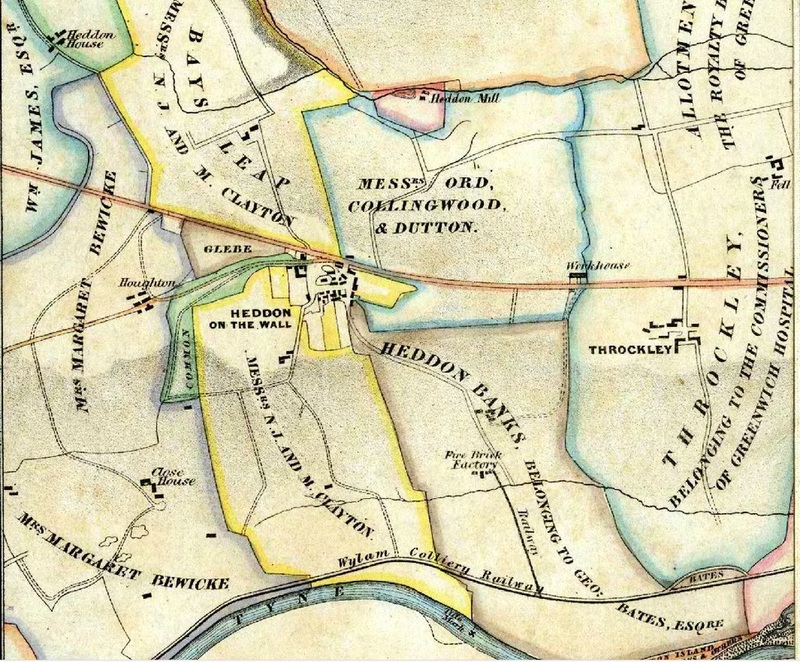 Coal mining went on around Heddon for a period of at least 400 years. The right of digging coal was included in the lease of the Great Tithes to George Mason in 1590. The sites of many of the early pits can be seen dotted over the countryside south of the village, their small spoil heaps often marked by small groups of trees, probably planted to hide the scars. Most of the early pits would have been bell pits, so called from their shape. In 1635, the mining rights in Heddon townhip were reserved to Ralph Carr and sold by his son, Francis Carr, to Henry Widdrington of Black Heddon, and from him in 1654 to Charles Howard (Carlisles) of Naworth Castle. Mining rights were subsequently leased by Lord Carlisle to Mr Barkas who employed William Brown as his overman, he being a very able mining man. Mr Barkas gave up the lease owing to the poor state of the coal trade and Wiiliam Brown subsequently went into partnership with Mr Bell, a wealthy Newcastle draper, to work the Heddon pits. William Brown had an antiquarian interest and saved the statue of Hercules from Vindobala (Rudchester) from further damage. In 1784 a Heddon Colliery was the first in the coal trade to start using mechanical means of 'screening' the coal to separate the 'round' (large) from the small. In 1788, there was a pit on the south side of the Hexham Road, half way between the Great Hill top and the Royal French Arms. It was worked to a depth of 30 fathoms. The coal was conveyed 21/2 miles down a waggonway to Lemington Staithes, and linked up with the waggonway from Wylam. Coal from the pits in Heddon was hauled down the hillside to the waggonway in so-called 'black wagons' with an accompanying 'dandy wagon'. The latter were railed-in, low platform wagons on which a horse stood and a brake man to check the downhill progress. The empty wagons were dragged back up the hill by the horses. Messrs. Bell and Brown built the row of houses on the Hexham Road in 1796 that were to become known as Frenchmen's Row. It was customary in mining communities up to about 1912 to be paid wages fortnightly which meant alternatively, 'pay-weekend' and 'baff-weekend' (meaning poor or blank). Margaret Pit, Heddon on the Wall. Photo A Curtis (2013). The last deep mine to be worked in Heddon was the Margaret Pit. It was situated about one kilometre to the south-east of the village, in the valley bottom. This was originally owned and on the property of the family of Cadwallader J Bates. It supplied coal to the village and also coal and clay to the 'Heddon Colliery and Fire Brick Works' located on Newcastle's Quayside. The Margaret Pit was both a deep mine and a drift mine, with drift workings going back into the hillside. In 1855, Barras & Co. were firebrick manufacturers at Heddon Brick Works, managed by John Brown (Whellan 1855) , Fenwick Charlton was the Pit Engineer in 1886, and a man called, Heddon Robert, a brick maker at the local brick works. 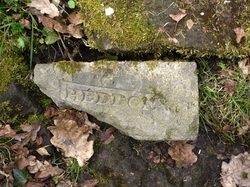 Firebrick from Heddon Brick Works. A. Curtis 2011. _The completion of the Scotswood - Heddon - Wylam railway line gave access to outside markets. A link line connected the pit and the Brick Works with the main railway line. In 1902, the pit was sold to the Throckley Coal company. Access allowed them improved control over water ingress in the Throckley pits.In 1906, Throckley merged with the brickmakers, Wm Stephenson & Sons and sank a third mine at Throckley, the Maria. They continued to work Heddon Colliery until the early 1930's, when it was closed, and the remaining reserves were accessed from the Throckley Isabella pit. 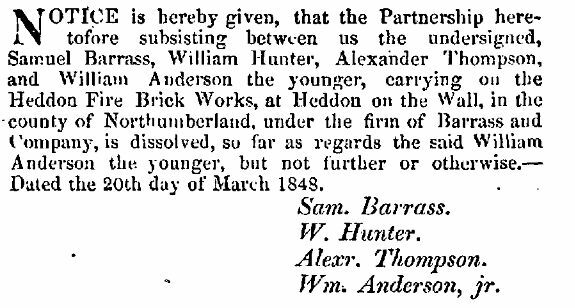 Dissolution of Heddon Fire Brick Works in London Gazette 28th March 1848. Coal, for sale locally, was brought up from Heddon Haughs in 7cwt tubs, hauled up by a steel wire rope driven by a stationery engine at the pit. At the top of the Station Road, a large wooden building was the coal depot, and coal was hauled away by horse and cart. A bungalow on the right ('Fairfield'), leaving the village to go down Station Road to Heddon Haughs, now stands on the site of the old coal depot. The line of the old tubway is still visible running due south down the field edge. During the period of the second World War the old workshops at Heddon Colliery yard were taken over by Kemsleys as an emergency printing works for the Journal and Evening Chronicle. A tilery, making concrete roof tiles, was opened on the site of the pit by a Major Johnson. The plant was sabotaged by a disgruntled employee, who lived at Blaney Row - he was sent to prison for it. The tilery had hardly opened before he ruined the plant which closed down shortly after. 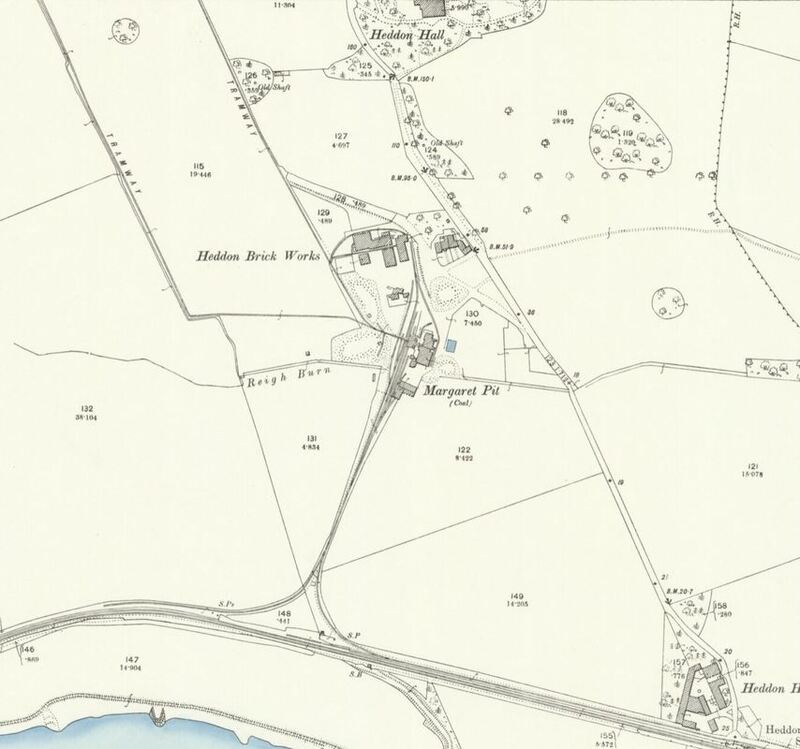 In 1957 the National Coal Board bought Bays Leap Farm, Town House and Heddon Mill to commence open cast mining. 70 acres of land was excavated to a depth of 200 feet to extract 2.5 million tons of coal. The land was returned to farming in 1965. Heddon Colliery & Brick Works. OS 25inch; Revised: 1895; Published: 1897.